April 16, 2013 • Page 20 1650 Houses For Sale shop online at www.missourivalleyshopper.com 1700 Merchandise 1705 Garage hanging gas heater $200/OBO.Call (605)6655643. 1705 Two High Quality Homes Applewood Area 404 Belmont 6-bedrooms, 4-baths, lots of extras. 2804 Preakness 5-bedrooms, 4-baths, fancy Call Kirby (605)660-1422 1655 Mobile Homes For Sale HIGHEST CASH PRICES PAID FOR MOBILE HOMES Call (605)624-8001. Save thousands on new mobile home. Set up in mobile courts in Beresford, Vermillion, and Yankton. We finance with proper down payment. Call for details. Nationwide Mobile Homes (605)665-0822. 1660 Acreage - Lots For Sale Items $100 or Less 32” Steel door. 6-double pane windows. 2-each of these sizes: 22x46; 22x58; 28x70. $100/OBO for all. Call (605)664-9606. Bath vanity, dark color with white ceramic sink, 26-inches, Delta faucet, four bulb vanity light fixture, $50. (605)665-5151. Beautiful queen size box spring and mattress, excellent condition, $100. Call (605)664-5440. Five- 8? Fluorescent light fixtures, twin bulbs with bulbs included. $40 for all. (605)760-4439. Items $100 or Less 1705 Left handed storm door 36” $35. Call (605)665-5643. Collection of 25 Beanie Babies with tags, mint, 1994-2004, all for $88. Also an extra John Elway #7 Bear. Call (605)665-2069. Men?s golf clubs, (605)665-9796. Four P185/75R14 tires, $100. (605)661-6935. Good used 12” culvert $85. Leave message if interested (605)660-9226. Ivory drape and valance, fits sliding door 84x98, includes all rods $65. Bathroom mirror 30x36 $10. Kirsch ivory mini blind 60” wide $25. (605)260-0585. 86710 578th Ave. Maskell, NE Quality built 116’x 265’ building on 3.8 acres. Features interior lights, 18’ ceilings, full kitchen, dining and 2-bedroom living quarters. Plus 10 unit mini storage building. Contact Carla (605)661-8643 Century 21. Maple twin bed with mattress, very good condition, $100. (605)665-9796. $95, Men?s single speed Schwinn bike $100. (605)665-9796. Refrigerator $75, SS Sink $20. Call (605)260-0224. Stove, smooth top $50. Dishwasher $40. Carpet $10. Call (605)260-0224. Items $100 or Less Two push mowers: one $65 and one $35. Cash only. (605)661-1073 or (605)661-3763. Wedding Dress size 10 strapless, 2 piece dress, $99. Call (605)260-0854 after 4pm. 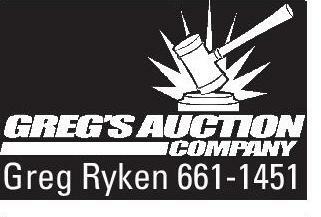 Greg Ryken 661-1451 Please Recycle When Done Reading! Antiques - 1710 Collectibles 1951 Ford F-2 Pickup, runs and drives, new radiator, brakes, fuel pump and exhaust system, $5,500 includes an additional parts truck 402-562-3754. 1725 Books Three push mowers: Two for $25 each and one for $35 - a Snapper bagger. (605)664-9539. 100 paperback westerns, $40 total. (605)659-1504. Vintage dresser, three small drawers, two 7-inch-deep drawers, $100. (605)664-7577. Please Recycle When Done Reading! Registered Angus Bulls For Sale Bred for calving ease & growth. Performance tested, guaranteed. Out of top bloodlines in the Angus breed. 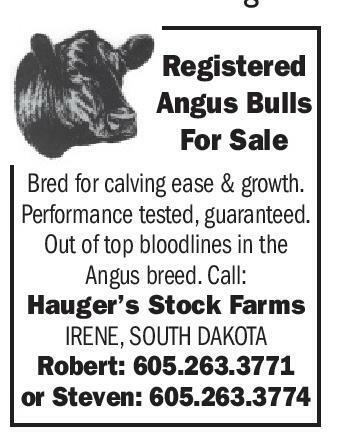 Call: Hauger’s Stock Farms IRENE, SOUTH DAKOTA Robert: 605.263.3771 or Steven: 605.263.3774 NO PAYMENTS FOR 6 MONTHS! YOUR FIRST PAYMENT BEGINS IN OCTOBER!! INTEREST RATES AT 2.99% W.A.C. ON 2008 & NEWER USED VEHICLES #12 7 #128737 42507 Songbird Near Tabor Access Private 11.48 acre economical property. 2006 3-bedroom, 2-bath home, full walkout basement. $219,000 Lisa, Anderson Realty, LLC (605)661-0054. Items $100 or Less 1705 Blue prom dress, size 11-12, $30. Black & white prom dress, size 11-12, $30. Pink prom dress, size 9-10, $30. (605)661-3076. 2012 CHEVY 1500 4 DOOR 4WD $ 24,99 24,995 95 #584812 5848 81 2006 DODGE 1500 4 DOOR SLT $ 14,99 14,995 95 #519689 519 1 #D11362 #D11362 D1 3 #B22430 B2243 2243 2012 F-150 CREW CAB 4WD $ 2 26,995 #106153 #10615 #106153 06 53 $ 38,995 #17 32 #177323 2013 FORD TAURUS LIMITED $ 2012 F-250 CREW CAB DIESEL XLT LT 23,995 23,995 #218919 #218 #21 1 #21891 21 $ 2012 FORD FOCUS SE 12,995 12,995 #D31112 D31 31112 For Sale: Lots of lots! Call Jim Tramp, (605)661-2192. Lots available north of Hillcrest Golf Course. Ridgeway North Development. 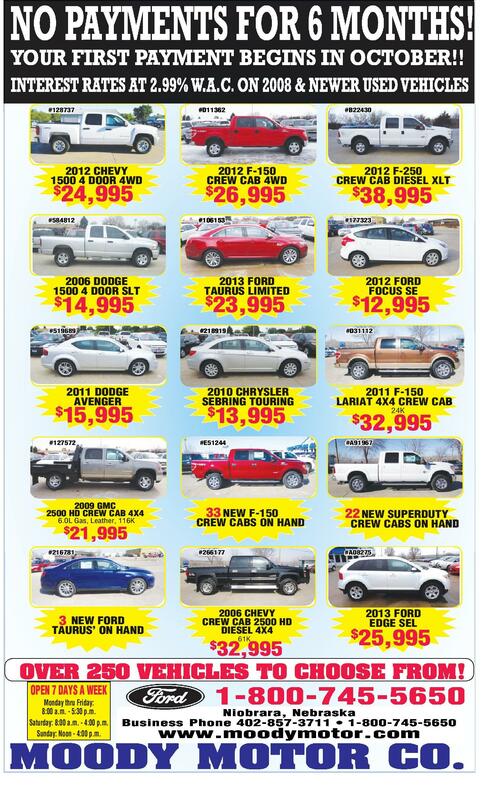 Call Kirby Hofer, (605)665-0524 or (605)660-1422. Multi-Family 100x170 lot on Sawgrass in Fox Run. $37,500. Lisa, Anderson Realty, LLC. (605)661-0054. 1685 Want To Buy Real Estate Attention: We buy mobile homes. Cash on the spot. Call (605)665-0822. We pay cash for used mobile homes! (712) 252-4381. 1690 15,99 15,995 , 95 #12757 #127572 127 7 7 2009 GMC 2500 HD CREW CAB 4X4 6.0L Gas, Leather, 116K $ 21,99 21,995 95 #2167 1 #216781 21 7 2010 CHRYSLER SEBRING TOURING $ 13,995 13,995 #E51244 51244 124 44 2011 F-150 LARIAT 4X4 CREW CAB LA AB $ 24K 32,995 #A91 7 #A91967 19 33 NEW F-150 C W CREW CABS ON HAND ND #2 617 #266177 177 22 NEW SUPERDUTY Y CREW CABS ON HA AND AN #A #A08275 7 Commercial Real Estate SMALL PLASTIC COMPANY FOR SALE: Operate full or part time. Move to your area. 563-872-4671 (MCN) 1700 $ 2011 DODGE AVENGER Merchandise Car trailer, two axles, 16’ side rails, winch, wood floor, spare tire, $1,200. Woods 42” belly mower for Farmall A tractor $375. JD 10-100 lbs. weights R58823 off 4250 $92/each. 402-396-3105. EdenPURE® Portable Infrared Heaters. Join the 3 million beating the cold and winter heating bills. SAVE $229 on our EdenPURE® Model 750. CALL NOW while supplies last! 1-888-686-8209 (MCN) 3 NEW FORD TAURUS’ ON HAND 2006 CHEVY CREW CAB 2500 HD DIESEL 4X4 $ 61K 3 , 32,995 $ 2013 FORD EDGE SEL 25,995 OVER 25 VEHICLE TO CHO 250 VEHICLES 50 ES CHOOSE FROM OOSE FROM! M! OPEN 7 DAYS A WEEK Monday thru Friday: 8:00 a.m. - 5:30 p.m. Saturday: 8:00 a.m. - 4:00 p.m. Sunday: Noon - 4:00 p.m. 1-800-745-5650 Niobrara, Nebraska www.moodymotor.com MOODY MOTOR CO.